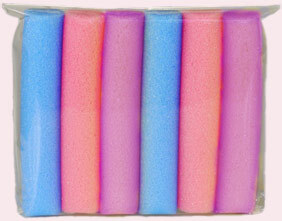 A set of Jumbo Curlers consists of 6 bendy foam rollers of dimensions ~1,3'' × 5,9'' (~3,2cm × 15cm). A single set is enough if your hair is thin and you want to curl it from your ears down. 2 sets is enough if your hair is thin and you want to curl it starting from the roots, or if your hair is thick and you want to curl it from your ears down. 3 sets is enough if your hair is thick and you want to curl it starting from the roots. 4 sets is recommended for those who have very thick hair and want to curl it from the roots. The total price for Jumbo Curlers depends on your geographic location. You can place your order for Jumbo Curlers after you choose your geographic location. Each price below is the total price for 1, 2, 3 or 4 sets of Jumbo Curlers including shipping and handling. Please allow up to 3 business days to process your order. Once your order is shipped, european delivery usually takes around 1 week, while delivery to the rest of the word usually takes from 1 to 2 weeks. Please make sure to provide a correct shipping address! Orders placed between December 26 and January 3 will be shipped on Januray 4 2019.